If you are in the process of changing or updating your kitchen or just planning ahead, you may be asking “how much do Granite and Quartz worktops cost?”. We will outline some of the important factors to take into consideration when shopping for granite and quartz worktops, many of these will affect the price you pay for the final product. This guide will help you to make an informed decision prior to setting your budget. A bespoke template will need to be taken of your worktops prior to placing your order. It is only after a template that a final and accurate price can be calculated, however the below information will stand you in good order when looking to get an idea of how much your new Granite and Quartz worktops will cost. Do You Already Have Plans or Sizes? If you have a new kitchen being installed you can simply send your plans to any fabricator to workout, alternatively your kitchen cabinet supplier can give you the measurements. However, there are other things to take into consideration. It is ideal if any existing kitchen worktops are off and the kitchen cabinets are exposed, however you can measure with your existing worktops in place too. Begin by taking a measurement of the length first , this is the longest measurement and should be taken from the back of the cabinets which are fixed to the wall rather than the front of the kitchen cabinet. 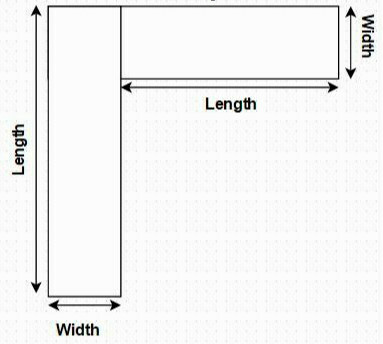 The width of the worktop is usually standard however take no chances and measure the width of the cabinets too (see diagram below). If your cabinets doors are already on you will now only need to take into consideration the worktop overhang, this is usually between 10mm and 15mm. If you have no doors in place you will need to take into consideration the thickness of the cabinet door (usually 20mm) plus any overhang. 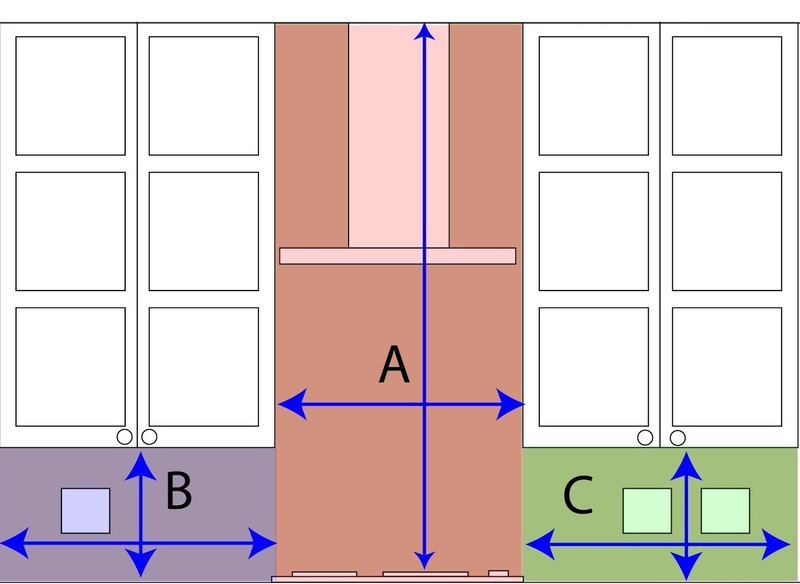 From our diagram below you can see our cabinet depth is 600mm, now we need to add on the door thickness (20mm) plus the overhang (say 10mm), total = 630mm. Next we need to calculate the total area in square metres (m2). To do this first you need to convert mm to metres, simply divide your measurements by 1000, so the width measurement from our diagram opposite will convert to (600mm ÷ 1000 = 0.6m). You will need to do this for every linear run of worktop you have. If you have an L shaped kitchen you will need the length and width for both worktops, similarly a U shaped kitchen will have three worktops. Once you have the these measurements you can now work out the m2. In our example opposite you can see an L shaped kitchen layout with the measurements. You now have measurements for the bulk of the worktop area you will need to cover. This price is just for supply only and usually does not include fabrication work, template and fitting (see below). Remember, the upstands are usually 20mm in thickness compared to the regular 30mm thickness for the main worktop, so the price per m2 for 20mm stone can be some 10% cheaper when compared with the 30mm equivalent. Simply measure the height and length of your splashback area from the top of the base cabinets right up to the underside of the wall cabinets. If you have different shapes and sizes you can divide the areas up and make individual calculations as above. Remember granite and quartz splashbacks are normally made in 20mm thickness, so they are cheaper per m2 compared to 30mm granite. Again note down the m2 for each area and total these up. This is the amount of material required to cover your splashback area. Next you will need to note down the number of socket cut outs, your supplier will charge on average between £30 – £50 per socket cut out. You will need to take your measurements down in cm2 or m2 and not inches. Take the widest measurement (usually from the back/closest to the window) and multiply this by the depth measurement. Be sure to add on some overhang, we would recommend some 5mm over the 20mm upstand beneath, so +25mm. This can be fabricated in both 30mm and 20mm depending on your personal choice. Traditionally quartz worktops were more expensive when compared with natural granite worktops, however as quartz has grown in popularity the manufacturing output has increased. As such there is more competition in the quartz manufacturing industry which has driven down the prices in recent years. 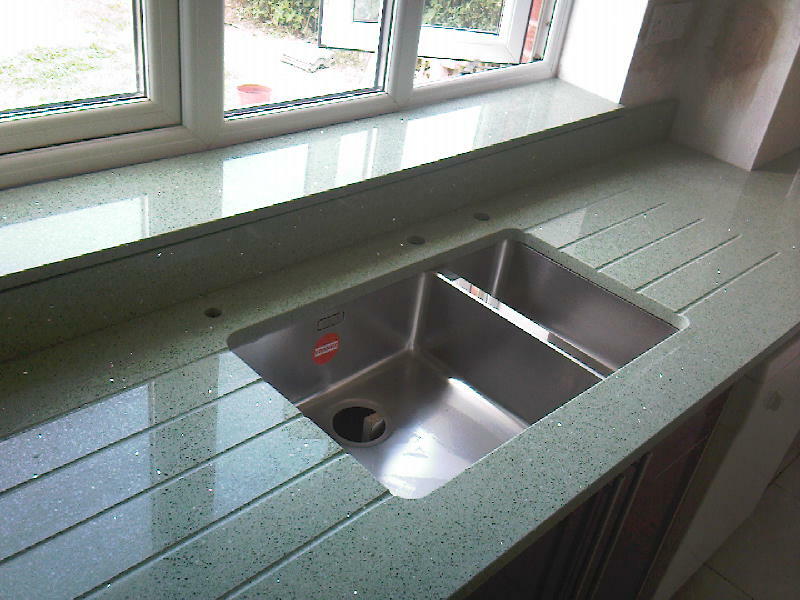 Regular quartz and granite worktops can be purchased at very similar prices at around £300.00 per m2. However newer colours from the quartz range such as the marble imitations and the latest matt finishes are considerably more expensive. Please read our guide on which kitchen worktops are best. The above information will help you to get an idea on how much you can expect to pay for the raw material. Next the worktops need to be cut and shaped. Most granite and quartz prices you are quoted will include the basic cutting and polishing to the exposed edges. The price may also include a basic chamfer edge profile to your brand new worktops, however it will not include prices for fancy edge profiles, to make cut outs for your hob, sink or any additional gadgets you have. What is the cost for granite fabrication? It is advised to check with your supplier if the cutting of the worktops, polishing the exposed edges and chamfering the top edge is included. Polishing and chamfering is charged per linear meter, now that you have the basic shape of your worktop layout you can work out the length of polishing/edging (in metres) required. Remember to only measure along the edges that will be seen. If your supplier (like Stone Culture) include edge polishing and a chamfered edge profile within the quote it is likely you will pay more for decorative edges such as Ogee profile, waterfall edge or bullnose edge finishes. Next you will need to take note of the number of cut outs required for the items that will fix to the worktops. This includes your hob cut out, sink cut out and tap cut out. Additional items such as pop up plugs or waste disposal sockets should be noted too. If you are opting for a an undermount sink which requires the inside of the cut out to be polished then specify this too. It is likely in this case you will also require drainer grooves at one or either end of the polished sink cut out. Finally you will need to take into consideration the cost to template and install your bespoke granite or quartz worktops. 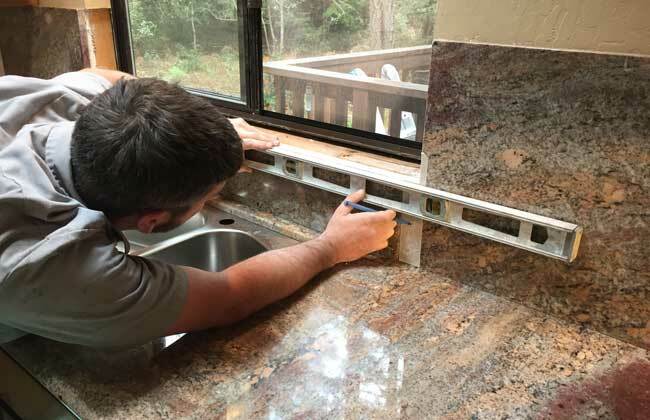 Remember Granite and Quartz is a delicate material to work and handle, as such we would recommend you always use experienced fabricators and installers to carry out the work. Ensuring the template and installation is done by the same team is vital to the overall success of the project. 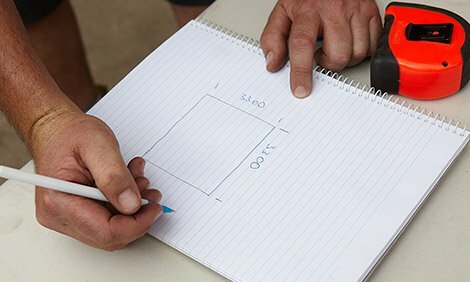 Experienced installers will have the correct tools and know-how to ensure your job is done according to plan the first time. Don’t take the liability for your tradesmen to handle and install your new work surfaces, it always pays to get experienced professionals to complete the job from start to finish. Typically you can expect to pay £300.00 for a template service and a further £300.00 for the installation. However it is likely this can be discounted when buying the worktops and having them templated and installed by the same supplier. We hope you find our guide on “How much do granite and quartz worktops cost?” helpful. Please feel free to leave us your feedback on this or any future posts you feel would be helpful to our readers here. Also, remember to read our blog on “how to prepare for a granite template” to ensure you are ready to take the next step with ordering your new granite and quartz worktops. For a FREE no obligation quotation please email your requirements to info@stoneculture.co.uk, complete our online inquiry form here or feel free to call our team on 0121 630 2251.